Albuquerque-area resident and vegetarian cookbook author Nanette Blanchard has self-published a booklet of her favorite southwestern plant-based recipes. Fiesta Vegan: 30 Delicious Recipes from New Mexico contains her take on traditional recipes such as Posole, Calabacitas, Sangria, and Capirotada. Each of the recipes includes a color photo and a nutritional analysis. Fiesta Vegan also offers a list of online sources for specialty ingredients and recommendations for New Mexico stops for food-lovers. The 40 page booklet is available either in print or as a .PDF download. You can also find a Kindle version without photos; information on all the booklet versions is on her web site here. Blanchard also maintains a food blog, Cooking in Color. If you can’t find prepared tostada shells you can simply serve this recipe on top of your favorite brand of tortilla chips. The Spicy Chile Sauce is also a great accompaniment to your favorite scrambled tofu recipe. To make Spicy Chile Sauce: Put all ingredients in saucepan and cook over medium/low heat, stirring occasionally, for 30 minutes or until thick and the flavors have all blended. 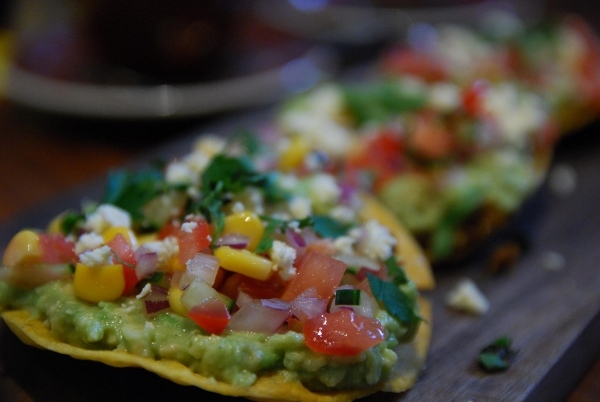 To assemble tostadas, place 2 tostadas per person on plate. Add ¼ of the Romaine and pinto beans. Top each with about 1/3 c. of the Spicy Chile Sauce and top with avocados, corn,jalapeños and black olives. Garnish with fresh lime slices. Per Serving (excluding unknown items): 1036 Calories; 30g Fat (37.7% calories from fat); 17g Protein; 95g Carbohydrate; 18g Dietary Fiber; 0mg Cholesterol; 503mg Sodium. 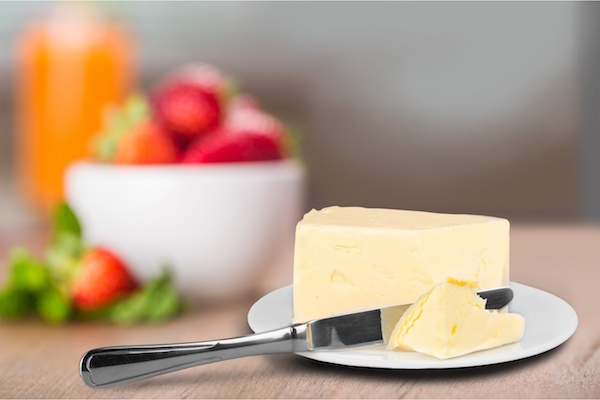 Exchanges: 4 1/2 Grain(Starch); 1/2 Lean Meat; 1/2 Vegetable; 1/2 Fruit; 6 Fat. 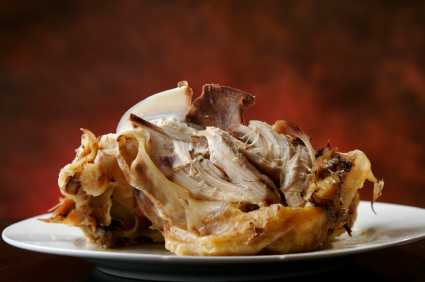 This is one of the simpler and quicker ways to prepare turkey. You can add mesquite chips soaked in water to the fire to add a little smoke flavor to the turkey legs. And go ahead, be daring and add a couple of tablespoons of tequila to the sauce. Grill over a fire with soaked mesquite chips added. Serve with hot German potato salad and ranch-style baked beans. You can read Mark Masker’s article on smoking turkey on the Burn! Blog here. 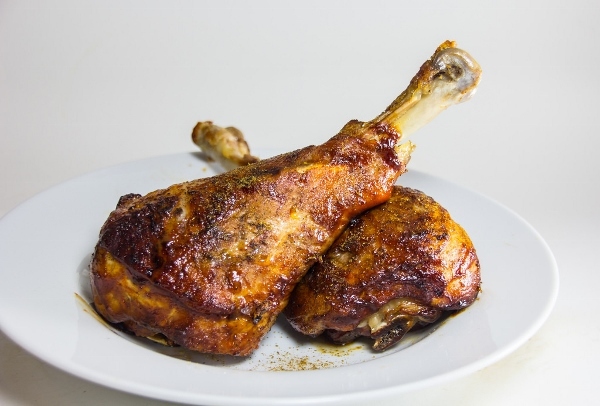 Grill the turkey legs over a medium fire, basting regularly with the sauce. Cook for 30 minutes, turning often, or until the internal temperature of the legs reaches 160 degrees F. for medium. Because scallops cook so quickly, they’re ideal for cold weather cooking. Try to get day boat or dry-packed scallops (scallops that haven’t been treated with sodium tripolyphosphate (STP) which causes the scallops to absorb water, increasing the weight and the price of the scallop. “Enhanced” scallops won’t sear properly due to the excess liquid. Remove the “catch” or side muscle from the scallops. Rinse the scallops under cold water and pat dry. Drizzle with olive oil and season with salt and pepper. In a small saucepan over medium heat combine the shallot, thyme and wine. (Never use “cooking wine.” Cook with a wine you would drink.) Simmer until the liquid is reduced by one-half, about 10 minutes. Strain into a blender bowl discarding the thyme and shallot. Add the roasted red pepper, chicken stock, jalapeño and lime juice; process until smooth. Return the sauce to the stovetop and cook until reduced by one-third. Keep warm over low heat. Prepare the grill for high-heat direct cooking. Place the scallops on the grill, close the cover and cook for two minutes. Using tongs, flip the scallops (if the scallop don’t release easily from the grill close the cover and cook another 30 seconds). Cook the scallops on the second side for another two to three minutes or until the scallops are opaque. Transfer the scallops to a warm platter. 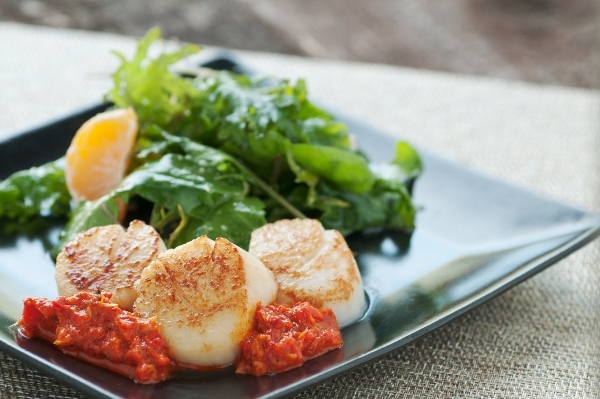 Place a dollop of sauce atop the scallops and serve over mixed field greens.